Fallout 76 is getting another big patch on December 4 that will begin trying to fix some of the game’s bigger problems, Bethesda said today on Reddit. In addition, the company said it plans to be more communicative in the future about what the Fallout 76 team is working on and when new updates for the game will come out. Increasing stash sizes. The stash size, which players have been calling on the company to increase going back to the start of its beta in October, will go up from 400 to 600 pounds. Bethesda said that number is still on the conservative side, and that it is still looking at ways of raising it even higher in the future, if it can do so without making the game more unstable. In lieu of anything more drastic, an extra 200 pounds will still be a relief to everyone who’s spent the last couple weeks staring at their inventory deciding which of their beloved guns to scrap. Improving loot drops for tough bosses. 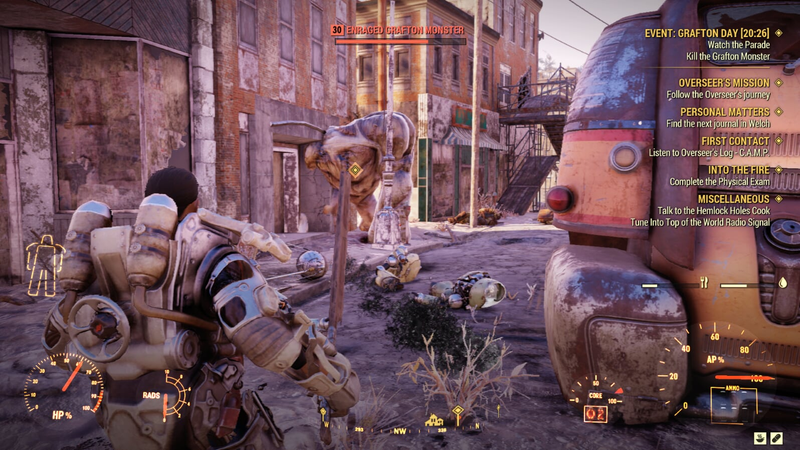 Loot has also been a major concern, especially as more and more players hit Fallout 76’s end game which revolves around nuking sections of the map to cause more powerful monsters to spawn. These bosses, including ones like the Scorchbeast Queen, can be real bullet sponges, and yet not always drop anything of real value for high level players. Bethesda wasn’t very specific, but it did say that after next week’s patch players would be guaranteed at least two or three worthwhile items from killing difficult bosses. Free at last: Players who have suffered from the glitch that causes them to remain trapped inside their Power Armor will finally be extricated from their horrible torment, since that glitch is being repaired. No more excessive backtracking: Currently, Fallout 76's respawn system forces overencumbered players to respawn back at Vault 76. After the patch, they’ll finally be able to respawn at the nearest discovered point on the map, rather than the other side of it. It’s anybody’s guess at this point whether the fixes in these upcoming patches will make the game crash less, or whether changes to things like stash size will actually create more problems. At least Bethesda has started to try and be more open about what’s coming down the road, rather than simply springing updates on players whenever they’re finally ready.